Disclosure: I participated in a campaign on behalf of Mom Central Consulting for Cascade. I received a product sample to facilitate my review and a promotional item as a thank you for participating. All opinions in this entry are my own. I love my dishwasher. I love how it sounds, I love how it cleans, and I love how it makes the dishes hot and steamy at the end of a washing cycle. What I don’t love is how grimy it can get after a while and how my dishes get a little filmy from time to time. Of course, that’s not my dishwasher’s fault. (I wouldn’t dare blame that on her!) The real reason is because of the dishwasher liquid I’m using. Since my current liquid has let me down one too many times, I was overjoyed when the folks at Mom Central asked me to write a review of the new Cascade Platinum Pacs. Right off the bat, what I liked about the Platinum Pacs is that you don’t need to deal with squirting dishwasher liquid into the little receptacle thingy. Just drop one of the little Platinum Pacs in the thingy and let them work their magic. And oh yes, they are magical. Not only do the Platinum Pacs clean food, grease and grime off your dishes, they use a “triple action recipe” designed to leave dishes virtually spot-free. As if that’s not enough, that same triple action recipe also cleans the inside of your dishwasher and prevents the build-up of hard-water film on your dishwasher walls and parts. Clean dishes AND a clean dishwasher? I’m a little aroused just thinking about it. After a few uses of the Cascade Platinum Pacs (at only about 29 cents per wash), I definitely noticed a difference over my old dishwasher liquid. Not only is my dishwasher cleaner, but so are my dishes! And clean dishes mean a lot to me because I take tons of photos of recipes and meals, and there’s nothing worse than great-looking food on a not-so-great looking dish! Speaking of the importance of presentation and preparation when it comes to meals, don’t forget to check out the info about Cascade’s partnership with Gail Simmons below. Also below, you can find out how to win a brand new kitchen in Cascade’s “My Platinum” contest. Good luck! Visit the contest website for information on how to enter and submit images. Each week, two contestants will be selected to receive a brand new Whirlpool dishwasher. Additionally, one lucky grand prize winner will receive a Platinum kitchen. Top Chef judge and editor of Food+Wine magazine, Gail Simmons, has partnered with Cascade to discuss why presentation is just as important as preparation. To learn more about Cascade’s partnership with Gail Simmons, check out the video below or visit the Cascade Facebook page and Cascade YouTube page. I hear these work super good! I haven’t got to try them as I don’t have a dishwasher, but hopefully soon I will and I can start using these! I love the idea of these packs..no mess!! No mess is always a big plus! We use these and I love them! Yay! Another fan of these! Just added it to my shopping list. 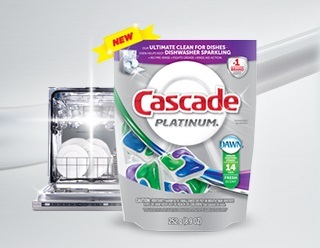 Cleans dishes and the dishwasher all for .29 – You can’t beat it – I have always like Cascade – I can’t wait to try them! I wish our dishwasher wasn’t broken; I’ve always loved cascade! Oh no! I would be heartbroken if ours broke! Hope you can get it fixed soon! My mom swears by Cascade! I dont have a dishwasher yet so sadly I’ve never got to try it,,, But my hubby “plans” on getting me one in the near future so hopefully I will get to try them soon!! I have used these and they work great and really leave your dishes very clean with no spots. I have been hearing so much as Cascade Platinum. The next time I go to the store. I am going to look for it. I LOVE Cascade! They’er the only brand that really gets my dishes super clean. I like the Cascade ones too – they are something powerful in the dishwasher! We use these and I can’t say I am in love with my dishwasher but they do make doing dishes a little easier! I usually use Finish and have been satisfied, but may have to give this a shot to compare. I am going to try this in a few weeks when my dish-washing soap runs out. Thanks a bunch! My dishwasher is broken but I agree, Cascade is awesome! Ooo I really want to try these!